Join the discussion on our forums! Come discuss Mana Bind over in our dedicated Mana Bind discussion topic. 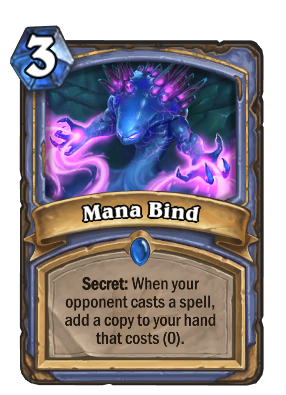 This card is amazing, not only can you find out what secret someone plays as you get a copy of it, you can also steal spell quest rewards, ie Warlock's portal. Did it yesterday. That was a fun game. Why should i run this over counterspell? With the Mage quest now revealed I think the applications are quite obvious. Seems great, the question is would you rather stop their spell with a Counterspell or get a copy of it. I'd probably prefer to stop it most times. I'd rather get a 0 mana fireball than stop a fireball. That's 6 free burn to burst down my opponent. Apart from having the same problem as [card]Counterspell/card], which is: being vulnerable to the coin, this secret is very hard to be played against. Most decks use spells for card draw/board clear/direct damage, which are always useful for a mage. And people saying quests are going to counter this because "you'll never be able to complete them", are wrong, because people will usually play quests in turn 1, because you always get the quest at mulligan, and this costs 3 mana. In very rare cases, if you start with Kabal Lackey and play this you will get the opponent quest (if they are playing it of course, I don't expect every deck in every class to play quests). Anyway, very interesting card, even tough I don't think it'll see much play, but I'll definitelly gonna test it. Looks cool, love the art, looking forward to the new trolden videoes of this card. Don't think it will go very competetive in the new standard. Well, Anyfin Can Happen in wild. I think regardless of the order you will get both a copy and a cancel. Youll be more likely to play this card in the late game before you play a powerful threat or something, otherwise it could be very counterproductive; similar to effigy, spellbender, stuff like that.